It seems that Hannah’s cats were infested with fleas, so I volunteered my screened porch to quarantine the little varmints while she flea bombed her apartment. First we locked them all in my bathroom and gave them each a bath with flea shampoo. FUN! Bathing Tabby (the little girl) was pretty easy, but bathing Dexter & Tony required both of us to keep them from flying out of the tub. I swear these cats have dog muscles! 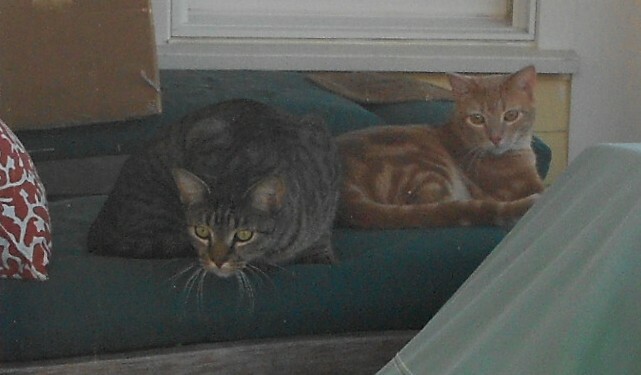 After a snuggle in a dry towel, each cat was placed on the back porch to await their Advantage flea treatment. They each recovered from their ordeal and settled down to check out their new pet hotel for the next three days. Thank goodness the weather has been mild lately because there was no way I was letting these monsters in my house while their fleas fled. Later in the evening they got some free entertainment watching some strange animals cavort in the back yard. Rosie introduced herself to an astonished Tony Cat. 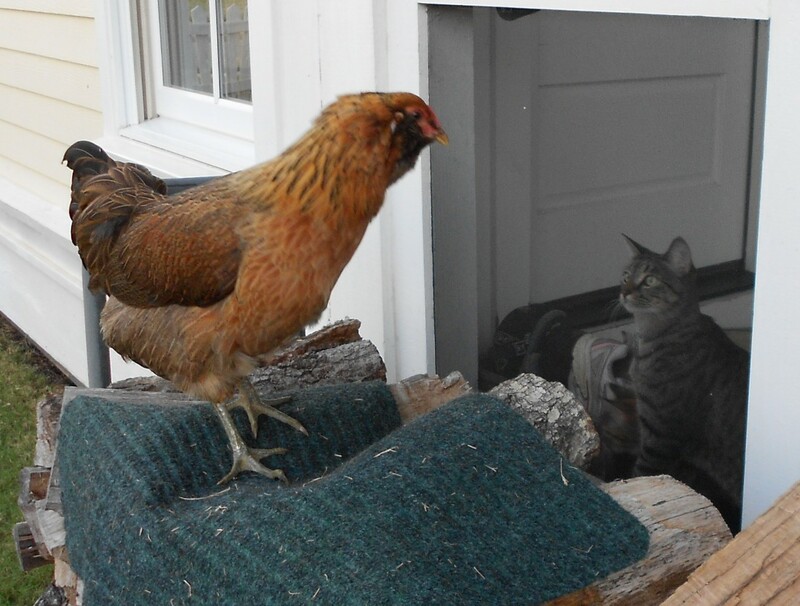 I'm a chicken you silly cat! 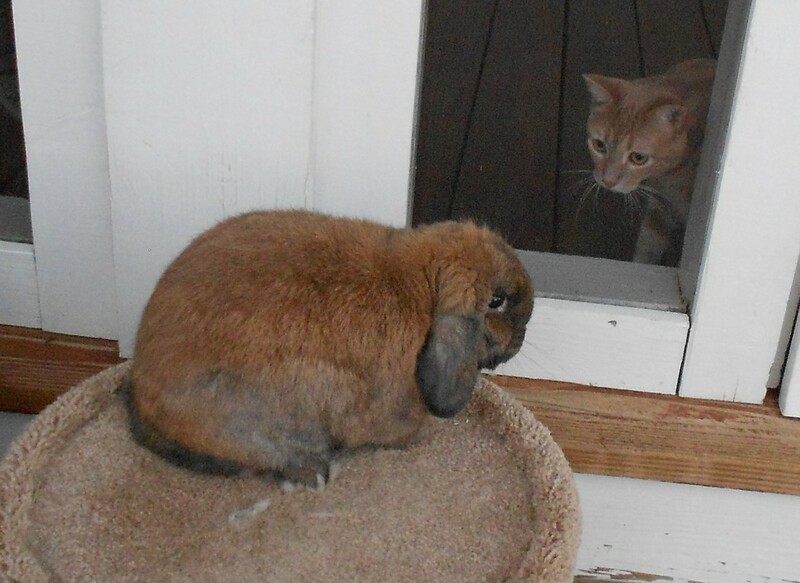 Dexter decided that Buster was the weirdest cat he’d ever seen. and for three days I actually had seven cats under my roof. Now I’m back to a reasonable four cats, three chickens, a bunny and one fuzzy husband–all flea free. “What the CLUCK?” Funniest caption yet!!! 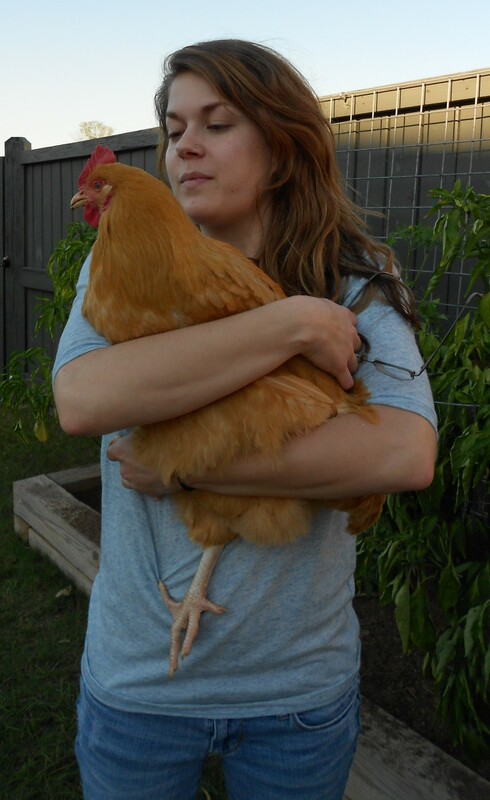 When I first got the chickens, I emailed the secretary at our neighborhood office and asked if I could have chickens. She got back to me and said that no, chickens were against our HOA rules. I wrote back…CLUCK YOU! She tell that story to everyone she meets. 🙂 Don’t tell Peggy I’m being naughty!